Roofing | Crowther Roofing & Sheet Metal, Inc.
Crowther Roofing focuses on providing the best roofing solution for your industrial, commercial or institutional property(s). From new construction applications to roofing replacement and maintenance, the Crowther commitment is to provide the most effective solution to your roofing needs. 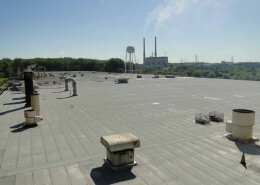 No two commercial roofs are alike as no one process is the best for every application. Identifying the most appropriate system requires knowledge of the specific conditions on each roof including the building environment and physical stresses to which each individual roof is exposed, and the performance of each system. Manufacturer warranties are available with nearly all roof systems installed by Crowther Roofing. For warranty inquiries please call us at (815) 726-2400.